Currently, the Andean tropical glaciers are in an accelerated process of retreat. These glaciers are considered a source of permanent water during dry winters and droughts in southern Peru. The situation has drawn attention, as water availability in surrounding communities is at stake. Coropuna is the largest and highest volcano in Peru, located in Arequipa—1,000 km (620 mi) south of Lima. With a maximum elevation of 6,400 m (21,000 ft), it is the third-highest point in Peru and is located in one of the driest regions—approximately 400 mm (16 in.) of annual precipitation. Based on this background, the Association of Sustainable Development (AEDES), which has worked helping surrounding areas adapt to climate change, contacted Peru's National Weather and Hydrological Services (SENAMHI). 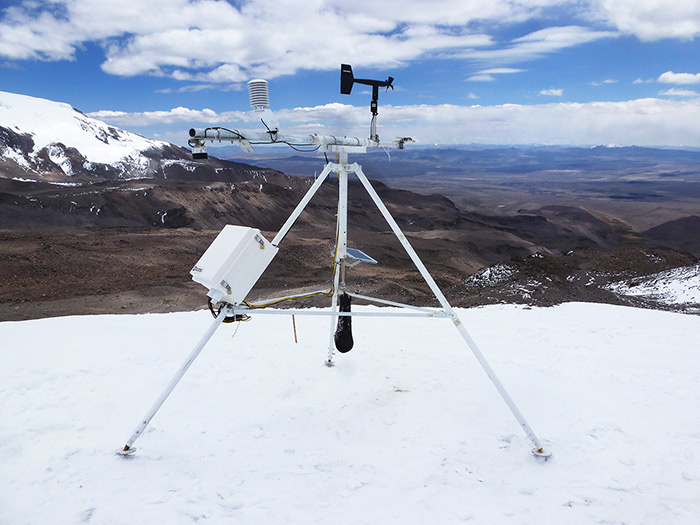 SENAMHI has installed weather stations on two other impressive Peruvian peaks: Quisoquipina, 5,180 m (16,995 ft); and Huaytapallana, 4,760 m (15,617 ft). These two installations were funded by a Comunidad Andina project. During their contact, SENAMHI and AEDES agreed to begin a joint project monitoring weather conditions on Coropuna to better understand the dynamics of the glaciers. It was decided to use the same station that was used in the Comunidad Andina project with some slight modifications: a CNR4 instead of a CNR1, and the alpine version of the R. M. Young 05103 wind speed and direction sensor. Special thanks to EnviroEquip (Campbell Scientific's representative in Peru) for their work in distributing the equipment. The installation was carried out between September 7 and 10 after a long trip: four hours by truck, four hours by mule, and two hours hiking. Participating in the installation was a group of four technicians from SENAMHI, two from AEDES, an engineer from Glacial and Hydrological Resources Department (UGRH) of the National Water Authority of Peru (ANA), and local community members who helped move the equipment to the installation site. The group operated from a base camp at 5,570 m (18,275 ft), and the installation site was at 5,800 m (19,000 ft). That elevation makes it the highest meteorological station in the Americas, Europe, and Africa, with only stations in the Himalayas being installed at a higher elevation. Currently the station captures information on air temperature (-6.1°C recorded minimum on the day of the test at 20:30), humidity, wind speed and direction, barometric pressure, net solar radiation, albedo, and snow height. This information will allow us to know the energy exchange between the atmosphere and the glacier, and help us understand why this peak has the highest glacier in Peru.